Another gift off my Christmas list! makes it SO easy to get matched socks. 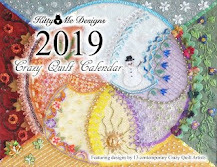 - Mary Corbet has posted a list of links to lots of free embroidery patterns that you might want to have a look at HERE. - Sharon Boggon has announced her plans for the TAST (Take a Stitch Tuesday) and Beyond TAST stitching challenge for 2019 and you can get further information HERE. If you would like to expand your stitching skills and learn lots of new stitches, this is a great way to do it! - If you are sharing a recipe with someone, perhaps you'd like to use THIS free site to create fun recipe cards - both virtual and printed. Thank you Joy for sharing this one and you might want to check out her post HERE about a cookie recipe blog hop that's happening right now. - If you have an over-abundance of scrapbook paper and are in need of a gift bag, perhaps the how-to found HERE might be what you are looking for. Today the quote is from Wale Ayeni...."Be thankful for what you have. Your life, no matter how bad you think it is, is someone else's fairy tale"
Another gift off my list! The pattern is a commercial one - McCall's M5551. - There are lots of great ideas for jar gifts HERE. - Have a drool cloth handy while you have a peek at THESE pretty sewing accouterments! - Who knew wire coat hangers could, instead of being in a tangle in your closet, become something THIS cool! 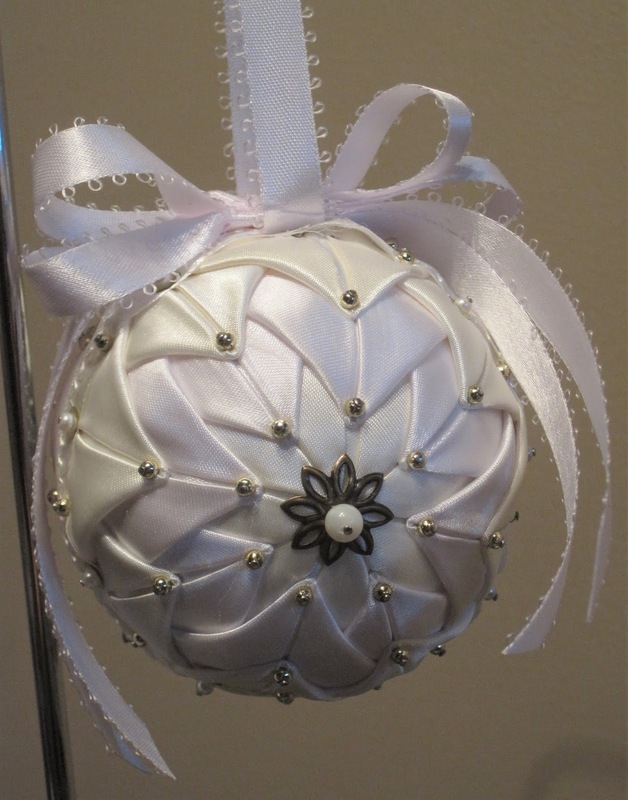 - Although THESE are shown in the context of being used for weddings, wouldn't they make great Christmas gifts too? - THESE would make pretty inserts for special hand made Christmas cards. 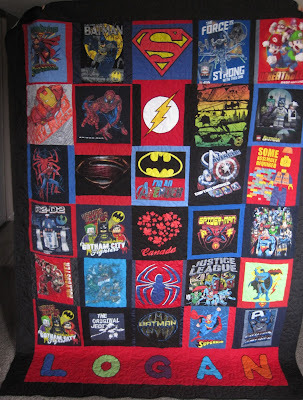 - Many of you are familiar with the wonderful mystery quilt projects that Bonnie Hunter shares and, in case you missed it, HERE is part one of the newest quilt. - Have a peek at the inspired adult version of an advent calendar found HERE! - THIS is a nice scarf pattern. It's one that will stay in place. And THIS is a similar design, but more shawl-like. - Another really clever idea for a cute gift can be found HERE. - With the current interest in anything plaid, perhaps THIS might catch your fancy. Another quote from an unknown source..."When buying from a hand maker, you're buying more than just an object. You are buying hundreds of hours of failures and experimentation. You are buying days, weeks & months of frustration and moments of pure joy. You aren't just buying a thing, you are buying a piece of heart, part of a soul, a moment of someone's life. Most importantly, you're buying the artist more time to do something they are passionate about"
This is a little project that I whipped up recently, using a pre-created crazy quilt block I had in my stash. Nice to hang over the arm of a chair so your sewing tools are at hand. - If, like many of us, you have a hard time thinking of Christmas gifts for your husband, how about doing something like THIS? And if you go HERE there are lots of ideas for the men in your life (most have links to commercial products, but nevertheless the ideas are good). - If you plan to give some lottery tickets this year, rather than putting them in a Christmas card and envelope, how about THIS idea for packaging? - There are some really cute little knitted Christmas stocking ornaments HERE. - There are some nice ideas HERE for making your own gift baskets. Today's quote is from Samuel Taylor Coleridge..."Advice is like snow - the softer it falls, the longer it dwells upon, and the deeper it sinks, into the mind"
What is a grandmother to do? 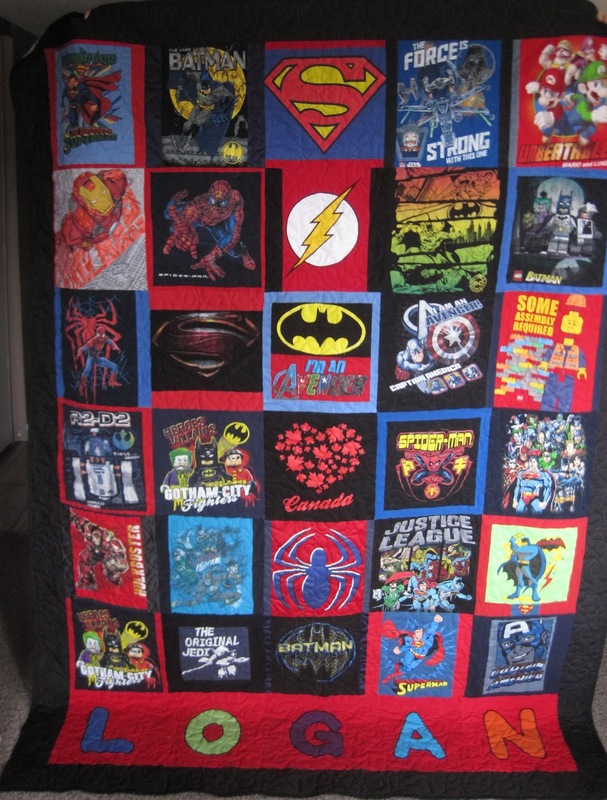 Yes, what IS a grandmother to do when there's a special request extended to make our youngest grandson a special blanket? A shark blanket, no less! This guy is in the process of swimming his way out to BC (via courier, NOT the miserable striking Canada Post!!). The pattern can be found HERE, made in the toddler size. Although, if I had to do it again I'd be almost tempted to make the adult size, just so there's a bit more room to wrap up in it. - THESE would be pretty on anyone's Christmas tree! - And how about THESE little sweeties? Or THIS one? - THESE are wow-worthy - be sure to scroll down to see the amazing examples AND at the end there's a link to how to make your own. - If you're searching for something fun to make for a small gift, how about THESE? - I absolutely love THESE!!!! Wouldn't they look amazing in any sewing room? And they'd make a wonderful gift for any stitcher! Today's quote is from Emmet Fox..."It makes no difference how deeply seated may be the trouble; how hopeless the outlook; how muddled the tangle; how great the mistake. A sufficient realization of love will dissolve it all. If only you could love enough you would be the happiest and most powerful being in the world"
The second attempt was MUCH better! The book is 'The Wonky Donkey' by Craig Smith. The pattern is by Gaelle Quemener of Du Reve A La Creations and can be found HERE. - THIS is what looks to be an excellent method of calculating how to make a sweater in any weight of yarn and in any size. - THESE are rather cute little snowmen. - There are a whole lot of watercolor tutorials HERE. - THIS is a rather interesting take on making snowflakes - cloth, not paper! - There are lots of Christmas quilt patterns HERE. - For the Dr. Who fans out there, check out the patterns HERE, HERE, HERE, HERE and HERE. - And not to leave the Harry Potter fans out, how about THIS, THIS, THIS, or THESE. - And what's a list like this without some Lego? HERE, HERE (link goes to PDF), and HERE. Today your quote is from Maya Angelou... "We must support each other and empathize with each other because each of us is more alike than we are unalike"
Some of you may remember me showing you a t-shirt quilt I was working on awhile ago that will be a Christmas gift for our #1 grandson who is four. Yesterday I put the last stitch into the binding and here it is....done......!!! - I mentioned the other day that I was seeing a lot of Buffalo Plaid lately, and THIS is something that might be welcome under the Christmas tree this year. - THESE wee yo yo trees would make excellent table favours at Christmas. - Some of you may be interested in what sounds like a fun cross stitch stitchalong that's being run by Pam Kellogg beginning in the new year. Have a peek at her post HERE for further information. - THIS is a rather cute gift tag idea, but I think they'd also make nice ornaments too. Great way to practice your free motion skills. - There are some nice ideas HERE for your Christmas decorating. Today's quote is from John Wesley..."Do all the good you can...By all the means you can.....In all the ways you can.....In all the places you can....At all the times you can.....To all the people you can.....As long as ever you can"
My fingers have been busy, honestly they have, but unfortunately there's not one single thing that's quite ready to be revealed at this moment. 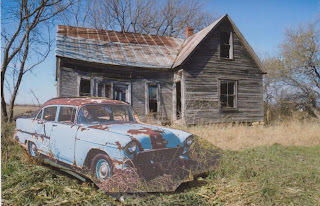 So...I will show you a picture of the next 'barn' (although this one features a house!) I will be working on. The pattern is all drawn up and I'm chomping at the bit to get started! - If you happen to have a collection of wine corks floating about (or feel the urge to buy some) you can find a really adorable Christmas use for them HERE (scroll down!). These would be perfect for little favours at a Christmas dinner. - At the quilt guild meeting this week a mention was made of jelly roll rugs - of course I hadn't heard of them and wanted to learn more. Thought you might like to see what I found, so go HERE. - There are lots of ideas HERE for creating fun shadow boxes for gifts. - HERE is a cute wee thing you could knit that would easily use up small amounts of yarn. - And another idea for using up fabric and creating something useful at the same time can be found HERE. - THIS is a great (and free!) online knitting magazine. Finally, I want to share my sorrow and grief at what is happening in California right now. Words simply can't express the sheer magnitude of the loss. God bless the people who have lost their lives, the people who have lost everything, and the fire fighters who risk their lives every moment of every day. 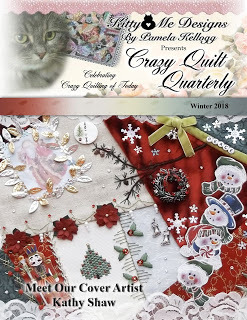 Winston Churchill, although referring to another type of devastation, said this..."We shall draw from the heart of suffering itself the means of inspiration and survival"
.....in the current issue of 'Crazy Quilt Quarterly' magazine. 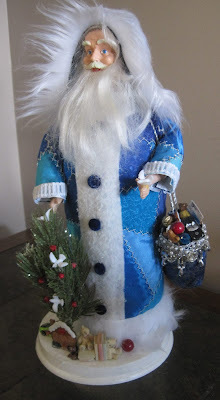 This is the Santa Claus (and tutorial to make your own) that I designed for the magazine and you can get your copy by clicking on the cover picture in the list at the side of my blog. - There are a LOT of free patterns available HERE. Pour yourself a cuppa and have fun! - If you go HERE you will find a link to the PDF for making an absolutely adorable little fairy door ornament. - I'm sure the more experienced knitters among you know all THESE little tricks for frogging, but sharing it here just in case you don't! - THIS is a nice tutorial to make fabric leaves for your fall table (or any time of the year). - THESE are rather cute little fellows - cheap to make too! Perhaps perfect for a bazaar item? - There's a slightly different take on a table runner HERE. - If you have a Star Wars fan on your gift list, how about one of THESE? This quote from Carl Reiner pretty much sums up my feelings about winter...."A lot of people like snow. I find it to be an unnecessary freezing of water"
I'll lead off this post with my thanks to everyone who extended their sympathy to us after the passing of Jack's sister. We are so grateful that your thoughts were with us. She was 83 and had been in a nursing home with Alzheimer's so it was hard to be too sad knowing that she wouldn't have wanted to live like that. Last week I did manage to finish up a set of Christmas ornaments that will be donated to the local quilt guild who are decorating a charity tree. I made these years ago and had forgotten just how time consuming they are to make - to say nothing about the sheer amounts of straight pins needed to make them!! The pattern can be found in many places around the internet - just google 'folded fabric ornaments' and you'll find all sorts of examples. Needless to say, going out in public is not something I'm about to do right now. I'm not vain enough to care what I look like but I certainly don't want people to look at me and then turn their eyes to Jack and wonder if he was the cause of it. 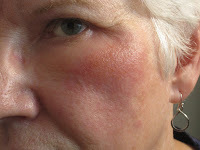 (hmmm.....maybe I've suddenly developed an allergy to him????.....hmmmm.......). This, too, shall pass - but I wish it would hurry up! - There's a nice free printable HERE for recipe cards - especially nice if you share a recipe! - THIS is a really cute stuffed polar bear that would be fun to make for little ones. - If you go HERE you can find a number of links to patterns for making Advent calendars. - If you bought some wool roving with grand plans to needle felt something and it didn't happen (we've all done that, haven't we!) you might be able to use it to make THESE wonderful angels. - If you, like many of us, have lots of fabric scraps and have trouble coming up with storage ideas for them, perhaps one of THESE ideas might be just what you're searching for. - Have a peek at the work of THIS artist. - THIS is a somewhat unusual take on a tote bag - and note the pretty added flower! - THESE might make great Christmas gifts for those with cold ears! Another anonymous quote..."As a kid I think I ate too many rice krispies. Now all my body does is snap crackle and pop!" - THESE are rather cute little guys that could be used in many ways. And THESE are too! - Have a peek at the things made by THESE artists! 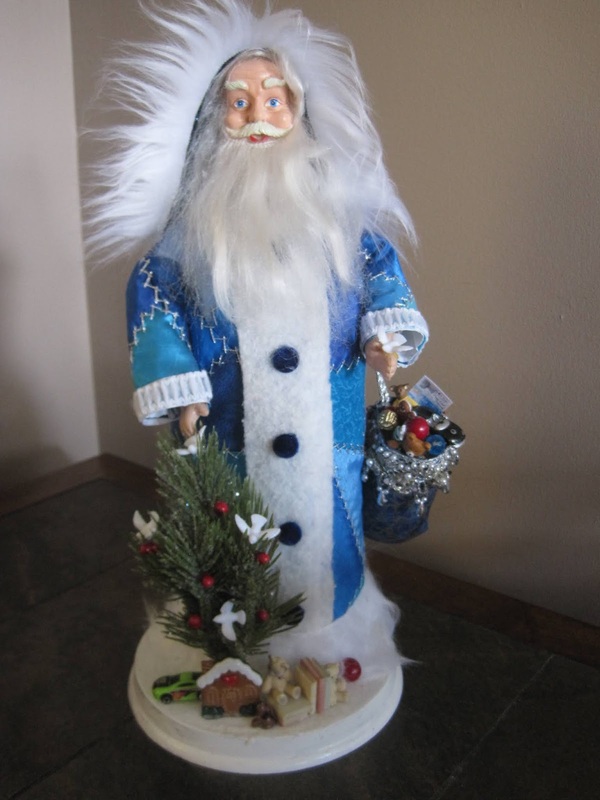 - There are LOTS of really nice Christmas decorating ideas HERE. And even more HERE! - And if you go HERE there's a really easy (stash busting!) Christmas ornament pattern that would be quick to make. - THIS is a really cute idea for mason jar gifts! Another anonymous quote..."Strength doesn't come from what you can do. 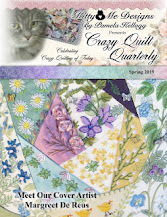 Strength comes from overcoming the things you thought you couldn't"
The latest issue of the 'Crazy Quilt Quarterly' is now available! Lots of fun things to peruse in this colorful issue...there are bears, and ornaments, and angels, and, well, you're just going to have to get your issue so you can see what other surprises are in store! You may get your issue from either MagCloud (digital or print) HERE or from Etsy (print only) HERE. - I just stumbled across THIS and thought it was one of the more brilliant ideas I've ever seen. Anybody ever used one?? At first I puzzled about how to actually use it, but if you click on all the photos there's one with a clear explanation. I think I'm putting one of these on my wish list!! - Thank you to Joy for giving me the head's up on THIS site - you quilters will be able to spend hours seeing all the amazing block patterns there! A perfect site to bookmark for when you are searching for a pattern. - Have a look at the work done by THIS artist! And THIS one too! - Many of you know that I'm a closet Lego-lover, so of course THIS fun Halloween project definitely caught my eye! (NOTE: it's a little late for this year I guess, but it's cute anyway). - HERE is a great idea for perhaps creating for *that* day in December? Or any other occasion for that matter! I really like this one. - There's a great tutorial HERE for a different take on a star quilt. - I haven't tried THIS pattern, but I plan to, mainly because I get a kick out of these guys. - If you have an ironing board and the cover is looking a tad grotty, perhaps THIS tutorial might be just what you've been searching for. Today's quote is from Albert Einstein..."If you want to live a happy life, tie it to a goal, not to people or objects"